Immediately after he was sworn into office Berkowitz then committed to a broad array of initiatives aimed at making the city more inclusive, tolerant, and engaged toward racial, cultural, and lifestyle minorities. He said he wanted to pass an equal rights ordinance for the LGBT community, hire interpreters, and create “language access plans” for city agencies. The new mayor, however, hasn’t taken action regarding the one policy that most naturally would show his administration’s committee to diversity: hiring some to leadership positions. Given the new Mayor’s focus on diversity I thought it was natural to wonder how he had fared in bringing cultural diversity to his own senior management team. I wanted to do a robust analysis of the racial and cultural diversity among the Berkowitz administration’s executive hires, however, the Mayor’s office chose not to provide a list of his executive hires and an on-the-record interview with the Mayor to discuss his hiring wasn’t forthcoming. It is curious that a Mayor so eager to discuss diversity out in the community would be so defensive about discussing it when it comes to his own hiring decisions. Since methodology and perspective are important here, let me explain how I did my analysis. 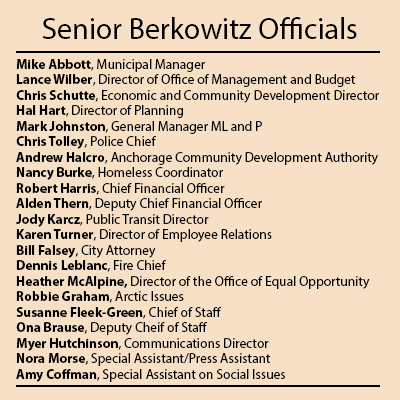 I identified 21 senior positions appointed or brought in by the Berkowitz administration since taking office. Since internal lists of executive hires were not forthcoming from the administration, I compiled one primarily using public announcements. The goal was to compile a list a reasonable person would conclude comprises the Mayor’s senior leadership team: department heads, policy aides, communications aides, and senior staff. I did not count support staff, front desk staff, or departmental hires below the director level. The one exception to that being deputy chief financial officer, which I did include because of its central role in municipal policy making. Of those 21 appointees currently hired only 4 (Susanne Fleek-Green, Robe rt Harris, Karen Turner-Williams, and Heather McAlpine) were identified to me by the administration as representing any sort of racial or cultural diversity. When asked, a senior administration official central to the hiring process was unable to identify any outreach or recruiting efforts the Berkowitz administration made to find culturally diverse candidates for these senior positions. This lack of diversity is odd for another reason, this Mayor has shown a willingness to look outside the box when looking for talent. He hired a Fire Chief who has never been a firefighter, a Police Chief who never worked at the Anchorage Police Department, and a director of Community and Economic Development who has no municipal planning or economic development experience. Let me be clear, I am not saying those were bad hires, but they would seem to show Berkowitz is unafraid to hire someone without a classic resume if he thinks the talent is there. This flexibility, however, has not resulted in a more culturally or racially diverse mix of executive leadership from the “diversity” Mayor. In fairness to the new Mayor many positions he had to hire couldn’t have had a wide pool of qualified applicants. How many people could even claim to be qualified to be police chief, fire chief, or municipal manager? The administration was also quick to point out they have launched internal policies to expand the diversity among rank-in-file municipal staff in the hopes future Mayors, or even a second Berkowitz term as mayor, will have a more diverse pool from which senior city leadership can be plucked. They say increasing minority access to city jobs, having senior administration officials create succession plans, and the administration’s engagement with minority communities around the city will help solve the problem.